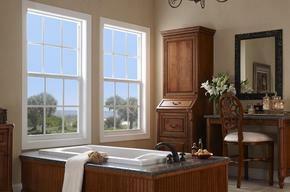 Tampa Bay and Sarasota, FL Double Hung Windows: Open from the Top, from the Bottom, or Both! PGT and CWS double hung windows were designed so both top and bottom sashes could be opened simultaneously to allow a natural convection to occur when cool air enters through the open bottom sash and the warm air exits via the open top sash. Another feature to double hung windows is both sashes easily tilt-in to make cleaning the outer panel of glass hassle-free. Double hung windows also feature a full outer screen to prevent bugs and debris from entering your Tampa Bay or Sarasota home while open. PGT and CWS double hung windows are available in High-Impact Hurricane Rated versions, which exceed even the most stringent High Velocity Hurricane Zone (HVHZ) Building Codes of Miami-Dade County as well as Non-Impact rated models. Call toll-free today for a free estimate and to learn more about the products and options available for PGT and CWS double hung windows. NEW 2015 PGT 5500 Series Vinyl Winguard Windows meet Miami-Dade County High Velocity Hurricane Zone (HVHZ) Building Codes. This also means they will be up to building code anywhere in the United States. As the original residential impact window, the Winguard has never had a single recorded failure during a natural disaster. This is the most popular residential replacement impact window in the Tampa, Sarasota, Manatee, and Pinellas County market. NEW 2015 PGT 5400 Series Vinyl EnergyVue Windows are the non-impact rated version of the 5500 Series Winguard. Using an impact rated frame and PGT’s superior insulated glass technology, the 5400 Series windows are designed to handle wind speeds well above 140mph in most sizes, ensuring your home will be safe during high windstorms. This window is commonly used in replacement window applications where hurricane shutters have already been installed or will be installed by StormTek. CWS EPIC Windows are manufactured in Ocala and are a very popular replacement window in the Tampa, Sarasota, Manatee, and Pinellas market. 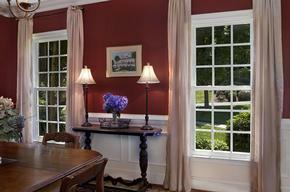 The EPIC Window features a vinyl frame, insulated double pane glass, and meets Energy Star Standards. The EPIC will also meet the Miami-Dade HVHZ Standards.